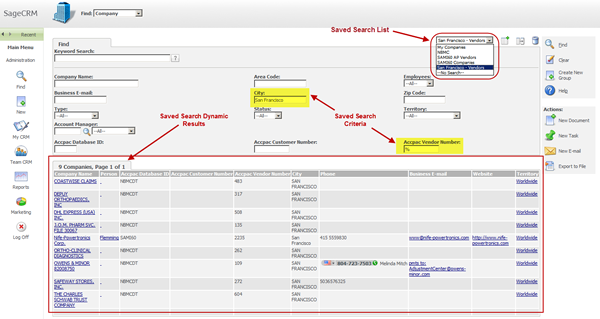 Saved Searches are a simple but powerful feature of Sage CRM. They can spare you the time and effort of manually keying in filtering criteria time and again when running your most frequently-used searches. Here’s a look at using this time-saving feature in Sage CRM. You can create a saved search against any of the main entities in Sage CRM including Companies, People, Opportunities, Orders, Quotes, Cases, Solutions, Leads, or Communications that match your search criteria. There is no limit to the number of saved searches you can create and save. In addition to creating your own customized lists, Sage CRM comes with a number of predefined saved searches that you may find useful. For example, the My Companies saved search available from the Find Company screen is set up to return a list of all of the companies assigned to you. Saved searches are dynamic which means they will always populate with the most up to date information each time you run the query. For example, let’s say you want to search for all companies in Sage CRM that are located in San Franciscoand have 50 - 100 employees. When you create a Saved Search based on this list, you’re saving the search criteria as opposed to the actual list. So when new companies are added to Sage CRM and meet the search criteria, the Saved Search is automatically updated. Click the New Search button next to the Saved Search drop down box. Now that you’ve got your favorite and most frequently-used searches saved, you’ll also save a bunch of time performing common actions in Sage CRM like creating a mail merge to multiple recipients, sending email to a group of contacts, running reports, and more. In addition, saved searches can be selected from the list of available content to display in your personal Sage CRM Interactive Dashboard. Now that you know how, go ahead and start creating some of your favorite saved searches and be sure to contact us if you need help.